Master showed me a bizarre film the other day of a girl who got covered in feathers which were stuck on by some sticky substance........ i must admit it made me smile to see it and part of me wished that i were that girl, not because she was pretty looking or anything like that , but because she was totally allowing her One to have contrl over her body and change it in a non permenent way , just for a short while. The girl then went on to be a chicken and lay eggs.. i am not sure what i thought of this , but i guess there again enjoyment was had by her partner and her so all was good. 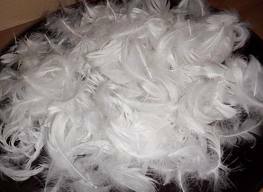 We have used feathers in play before, the word as a code name that is personal to Master and i, and the actual thing, but never in this way..........i had always thought that they were a bit bland , and did not get that much from them, but this couple we wathed obviously did. i think that this comes ( me not enjoying it ) from having to pluck so many game birds as a child , and from the children having a massive pillow fight when they were young , feathers going everywhere and it was pain to clean up. Part of me would like to feel free enough to explore that part and another wonders if i would stress so much with the memory of the mess that the feathers created before if i would everr get any enjoyment from that type of play. However i forget momentarily that the choice is not mine and i will do as i am told . If He decides one day i am to be His bird then so be it .